On January 7, 2016 I had the pleasure of interviewing Julia Lannin (nee McCall) at her home in West Allis. 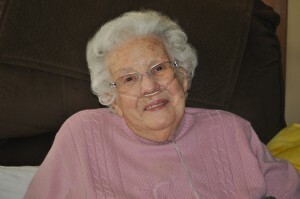 Lannin served as a neurosurgical nurse in the Army during World War II. She was one of ten children born and raised in South Carolina. 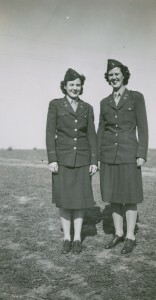 Lannin and her older sister, Olivia, attended nursing school and joined the Army together in 1943. Three of their brothers also served during the war, in various theaters. 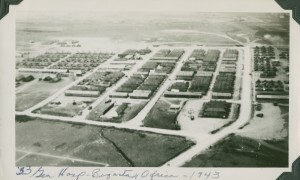 Assigned to the 5th Army, 33rd General Hospital the sisters were sent overseas in June of 1943, first to Casablanca and then to Bizerte, Tunisia (Africa) where they were stationed for approximately ten months. In Africa she met Gordon Lannin, the man she would later marry, who was also serving in the Army. From Africa the hospital and staff were transferred to Italy, first to Naples and then to Rome after Rome fell to the Allied forces. 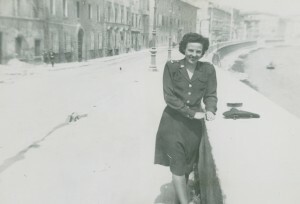 The nurses continued to move around Italy, spending time in Viareggio, Pisa and back to Naples where Lannin was when the war ended. After a quick tourist trip to Switzerland, the sisters were sent back stateside and Lannin was discharged in April of 1946. She eventually moved to Wisconsin where she and her husband raised six children. In the interview Lannin recounted multiple stories about her work as a nurse and memorable patients she worked with. Lannin met some great characters, including a surly sailor who had a severely injured leg. He was her hospital’s first patient to be treated with penicillin. Towards the end of the interview Lannin discussed how rare it was to talk about serving and about the war, even with her husband or her siblings. She mentioned that she has been receiving more recognition for her service in recent years. I hope that conducting and preserving this oral history interview, along with the other materials Lannin donated to our Permanent Collection including the photos seen here, is just one way that the Museum and the people of Wisconsin can show our appreciation for Lannin’s service.